I love the taste of tamarind. The tangy flavours remind me of a lemon sherbert but without the cloying sweetness. When Steve and I travelled through South-East Asia last year we snacked on tubs of tamarind fruit seasoned with chilli and salt - it makes my mouth water just thinking about it. 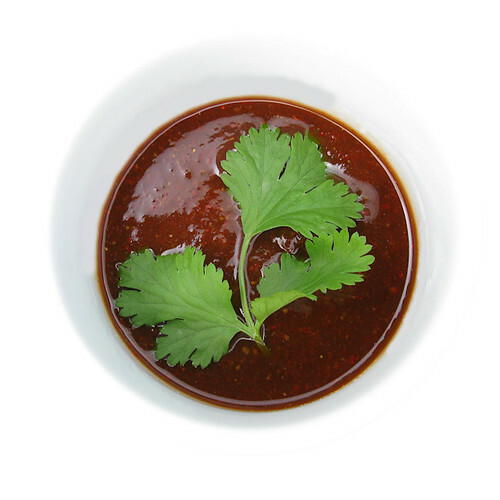 Tamarind chutney is quite often served as an accompaniment to snacks such as bhajias, bhel puri and pani puri. The recipe for the chutney below is relatively thick and designed to be served with bhajias. If you prefer/ require a more watery version slowly add additional water in step 4 until you achieve the required consistency. Separate the dried tamarind to increase the surface area. Place the tamarind in a small pan and pour over 150 millilitres of the boiling water. Put a lid on the pan and heat on a lowish heat for 10 minutes. The tamarind should now be soft and the water a dark brown colour. The majority of the water will have been absorbed by the tamarind. Take the tamarind and water mixture off the heat and then using a nylon sieve, sieve it into a small mixing bowl. Use the back of a wooden spoon to push the pulp through the sieve. Extract as much of the tamarind as possible, periodically removing the pulp from the back of the sieve into the mixing bowl. Expect this process to take time and energy - I tend to do this when I'm feeling a bit grumpy(!). Add the salt, chilli powder, coriander-cumin powder, lemon juice and the remaining 50 millilitres of boiling water. Stir well and leave to cool. Place in a small serving bowl and garnish with the coriander. I had some Tamarind chutney today from my indian colleague. She mentioned, that she also add sugar to it. Would you do it or just leave the sugar away?